All Research and Ideas Publications Are Now Available for Free in Our Websites! 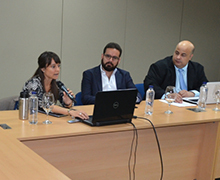 The Global Foundation for Democracy and Development (GFDD) and its sister institution in the Dominican Republic, Funglode, alongside its Center for Economic Studies, presented the launch of the Spanish translation of Jenna Giandoni’s Impact Investing in the Dominican Republic in an activity held at Funglode headquarters in Santo Domingo. The event served as a venue to discuss salient points and findings concerning the burgeoning field of impact investing, and counted on participation from Jenna Giandoni, GFDD fellow and author of the study which gave name to the event, Rafael Nazario, Executive Director of Fundación Central Barahona, and Roberto Herrera, InterEnergy Holdings manager for the Dominican Republic. The discussion was moderated by David Ricardo Pimentel, from the Center for Economic Studies. During the encounter, held at 7:00 p.m. on November 16, opportunities and challenges for impact investment in the Dominican Republic were analyzed through a discussion centered on a selection of Dominican companies and community programs implemented in the sectors of renewable energy and sustainable agriculture. Giandoni related her findings on investment-centered projects initiated by the Asociación de Productores de Leche La Cabrita and the Centro de Producción Piscícola Bombita in Barahona; Chocal y Chocolala in San Francisco de Macorís; and the Grupo Empresas Dominicanas de Energía, which form the foundations of her study. One of the main takeaways from the panel discussion was that focused impact investments can spur community development. In this regard, Giandoni assured that the businesses she studied have positively impacted the communities in which they operate through the development of environmentally-focused programs and the creation of renewable energy, among other actions. Rafael Nazario, Executive Director of Fundación Central Barahona, spoke about the creative process and development that the Centro de Producción Piscícola Bombita has had as a result of beneficial impact investments. Nazario stated that the initiative has reduced crime rates and led to the creation of other profitable businesses in the community. Bringing his unique perspective to the discussion, Roberto Herrera, InterEnergy Holdings manager for the Dominican Republic, remarked on renewable energy projects begun in the Dominican Republic following the conclusion of Giandoni’s research in 2015. Giandoni’s investigation forms an integral part of GFDD/Funglode’s vision of bringing new perspectives and innovative approaches and solutions to pressing issues and challenges of contemporary society in the Dominican Republic and the Americas. The publication, Impact Investing in the Dominican Republic, is the result of Giandoni’s participation in the GFDD Fellows Program from January to March 2015.